Got up relatively early, and enjoyed Travellers breakfast – consisting of bread for toasting, tea and cereal, more than enough to keep me going, and waited for Sunny’s message. It wasn’t until 10 that she replied, and admitted that she’d stayed out longer than planned, and wasn’t feeling fantastic, so it would be better if she met me in the late afternoon/evening. I’m more than a little irrated. The only reason I’m in Singapore is to see her, and not only had she gone clubbing the night before (something she admitted she hadn’t done in a long time), but stayed out to a time where she was never going to be functional the next day – the only full day I’m here. It was a little hurtful, especially since of all the people I met up along the way, she was the most interested and was contacting me every country to see where I was and when I’d arrive. Anyway, with most of the morning gone and my plans fallen apart, I root through the discount options at Travellers and decide to go to the Zoo. I adored the Night Safari last time I was here, but had never gone to the zoo in the day. Armed with directions and a ticket, I headed off on the subway system once again. I was warned when I left that it takes a significant amount of time to get to the zoo. Its not on the subway system, so you have to make it to Ang Mo Kio station on the Red line, and then get the 138 bus – which is at least 40 minutes, but stops just outside. Taxi’s supposedly only take 15 minutes and aren’t that pricy, but I gave the bus a shot anyway. 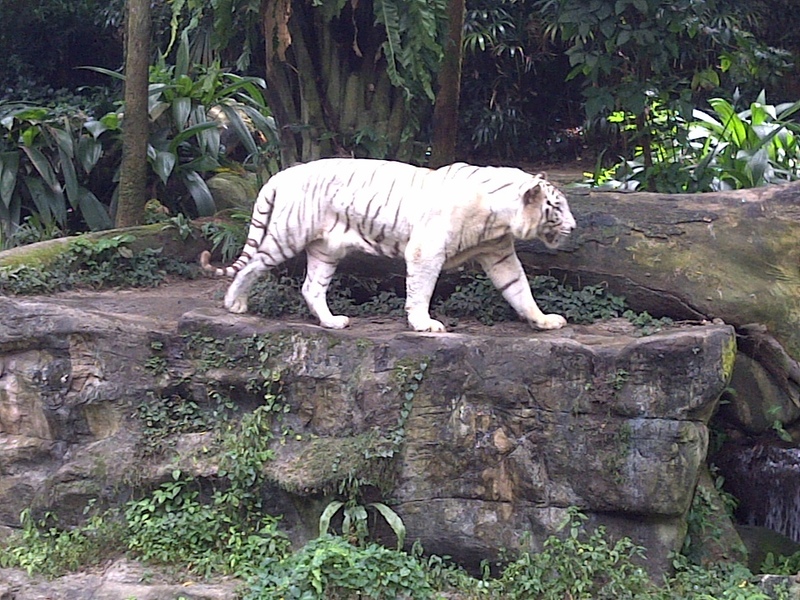 For some reason, despite having been to so many animal attractions on this trip, I’ve yet to catch Animalitis, and Singapore Zoo is a great place to spend a day. Despite getting there after 12, the zoo wasn’t jam packed, and I was able to walk around at my own leisure. The biggest issue was the the park’s layout isn’t fantastic if you want to see everything without double back – be prepared to return to certain enclosures several times to circle an area you missed. Had to double back half a dozen times during the day. They’ve also got the Fragile Forest enclosure, which is an enclosure you can entered and designed to be similar to a rainforest habitat, with reptiles, tiny deer, lemurs, fruit bats, butterflies and dozens of birds roam free. 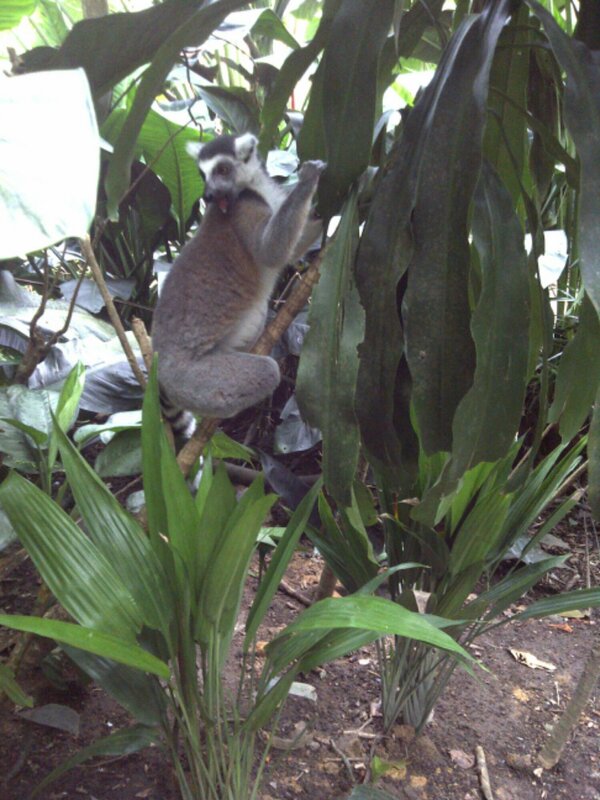 The lemurs are by far the least fazed by people, though you have to keep an eye on your bag. Also have chances to feed the animals, and a few typical ‘zoo’ shows. Only went to one, and didn’t think it was great – very much aimed at small children – but otherwise this was actually one of the best zoo’s I’ve ever been too. I ended up spending 3-4 hours here before I managed to get round everything, and left quite satisfied considering it wasn’t how I’d planned to spend my day. Grabbed the 138 back into town (getting very full – this is a very busy bus when the day gets late) and got back to the hostel in time to shower and coordinate with Sunny. She still wasn’t feeling great, so we agreed to meet at Newton Station and go to the Hawker Centre. However, my luck wasn’t changing without a price. While getting ready the jade ring I bought in China slipped off the bed and fell to the tiled floor. It shattered instantly. I spent about 10 seconds trying to collect the pieces together before I realise its pointless. I’ve been wearing this ring so long its left a suntan mark on my finger, and my hand feels bare without it, but I’ve left most of the countries that would easily be able to replace it. Meet up with Sunny, and while we’re talking, discover that despite talking to her months before I left, and while I travelled, the actual fact that I was only coming to Singapore to see her had never registered. She assumed I was here to see Singapore and seeing her would be a happy bonus. Next time I’ll have to be more specific…and stay longer so its not all hinged on just one day. The Hawkers Centre was outside, and filled with the typical food stands. 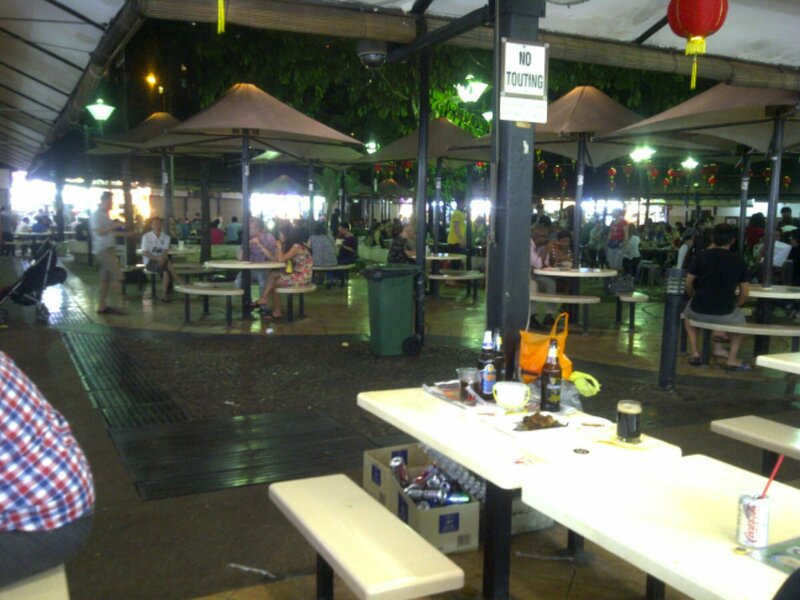 Hawker centres are very common in Singapore, and where the locals generally eat – basically very cheap food courts. I wasn’t sure what I wanted, and we wandered round, eventually ordering beef soup, and Sunny ordered a curried crab dish for us to share. Discovered after she bought it that she really wasn’t hungry and had been expecting me to eat the majority – which was difficult considering I’d just had a bowl of beef noodle soup (and since it was really hard to get to the meat of the thing through the shell). It wasn’t the day I’d planned, but at least I’d seen Sunny before I left. Tomorrow is the last of my long bus trips and the penultimate destination. Kuala Lumpur. 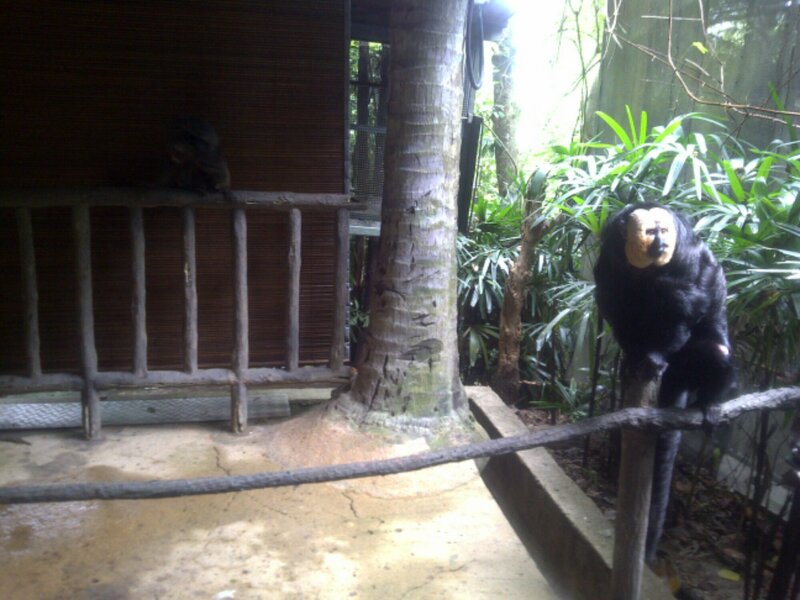 This entry was posted in Diary, Singapore and tagged Newton Hawkers Centre, Singapore, Singapore Zoo, Travellers@SG. Bookmark the permalink. Nice write up. Glad you enjoyed the zoo at least!